Executive log cottage, accessible year round, with 43 acres of private forest awaits you with professionally designed cross country skiing and walking trails. 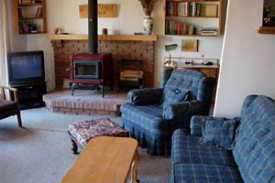 Interior decor displays hand crafted furniture and wood carvings, a large pine kitchen with lots of equipped cupboards and new appliances, including a built in dishwasher. Central heat and wood burning fire places provide cozy comfort and atmosphere. The 4 bedrooms include the master, which overlooks the lake, queen bed and ensuite bath, 2nd bedroom (double bed), 3rd bedroom (2 double beds), 4th bedroom on lower level (queen bed). Enjoy satellite TV, DVD, VCR, a laundry room with washer, dryer and an extra refrigerator. 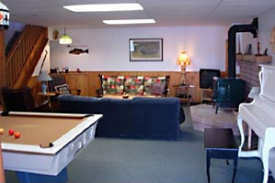 The finished walk-out basement has a large games room featuring a pool table, bar, piano and a fireplace. Outside, you'll find a screened porch, gas barbecue, outdoor fire-pit, and large dock to enjoy the sandy beach, canoe and paddle boat. All utilities included in rates, long distance extra. 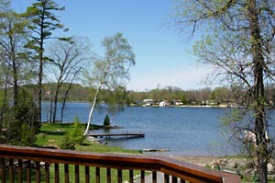 For more information, please visit ricelakecottagerental.com. 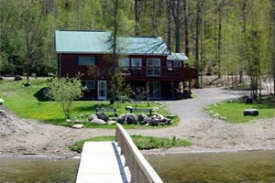 Off Season rates available, please inquire. Now Taking Fall & Winter Bookings.